The relationship between charismatic male college professors and naive young coeds can be freighted from the get-go. Take an impressionable young woman at an age in which she is exploring her own identity and goals, cast her into the orbit of a man decades older possessing not only substantial knowledge and the ability to inspire but significant power, then throw in some sexual attraction. Bam! You have the makings of a relationship that is fraught with imbalance. Such is the setup for many a popular story line in books, movies, television. And in the hands of a lesser writer, Jessica Lott’s literary debut could have become clichéd chick lit. 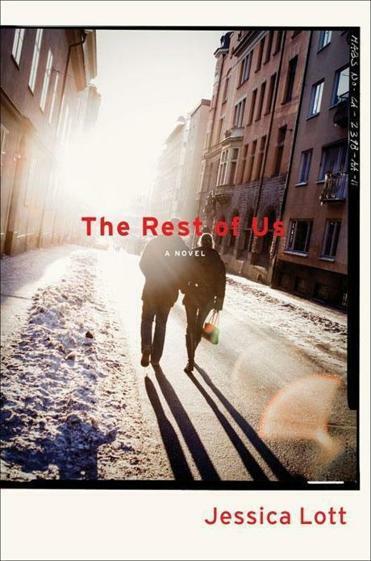 But Lott focuses less on the beginnings of the relationship than on its aftermath, years later, and “The Rest of Us” proves to be a compelling, resonant, richly nuanced, and sometimes heartbreaking portrait of cross-generational love and the meaning of art. The novel opens with the obituary of Pulitzer Prize-winning poet and scholar Rudolf Rhinehart, which casts 34-year-old photographer’s assistant Terry into a morass of self-reflection. She recalls her tumultuous affair with the attractive writer some 15 years earlier, when the two met at an artist lecture and fell into a conversation about mothers. They forged an improbable, tenuous connection that slowly blossomed into friendship. Terry recalls, “If I hadn’t been in the grip of some sort of magical thinking, I would have recognized that he was in his forties, nearing the height of his career, and a professor. I would have been intimidated.” But instead, Terry plows ahead, pursuing Rhinehart and finding herself falling madly, a little obsessively in love, pulling Rhinehart along with her. While the affair doesn’t endure, it leaves a lasting impression on Terry, and she hasn’t felt “the same type of passion, that soul-bearing intimacy” with anyone since. Rhinehart’s obituary brings a fresh rawness to that hole in her life and causes her to reexamine where she is now — single, lonely, living in a New York walk-up, and stuck in a dead-end job, having abandoned her dreams of becoming an art photographer. Terry tries to climb out of her funk by picking up a camera for the first time in years, and on the advice of best friend Hallie, who is both sounding board and witty, acerbic guidance counselor, buying a new wardrobe. Despite misgivings, Terry winds up in Bloomingdale’s during the holiday rush, and there, amid the “atmosphere of repressed panic and desperation, the overheated crush of people and sale signs and mirrored lights and the heavy, artificial odor,” she runs into Rhinehart, very much alive, attributing his mistimed obituary to a technical error. He is married to an art dealer, Laura, but not happily. And after a particularly hysterical (in both senses of the word) and drama-laden dinner party at the couple’s house, which Terry reluctantly attends in the expectation of “catching up,” she and Rhinehart slowly, cautiously renew their connection. This time, after Rhinehart splits with his wife, the couple forges a more mature relationship in which respect, need, support, and artistic inspiration flow both ways. As Rhinehart confronts issues of aging, resulting in a pilgrimage to explore his Ukrainian heritage, Terry looks not back but forward, finally determined to change her static life and rekindle her own artistic aspirations. Along the way, she is courted for her photography by Laura, who is initially unaware of Terry’s new relationship with her ex-husband, creating an extra level of ethical and emotional complication. Though not particularly plot driven, “The Rest of Us” is beautifully paced and totally engrossing. Lott writes with directness and clarity seeded with occasional moments of vivid insight and telling detail. She brings to life compelling yet realistic characters that are flawed yet sympathetic, characters I’d happily invite to a dinner party any time — drama and all.